WFM Nsisong Asanga (right) with reserve player Oluchi Alexis at the 2012 Olympiad in Istanbul, Turkey. Photo by Daaim Shabazz. Dr. Nsisong Bassey Asanga went to Istanbul unsure of what her travels would bring. With a very busy schedule as a medical doctor, a wife and mother, she has little time for intense training, but went with an abundance of optimism. Not knowing what to expect, it was a celebration of joy after she met the requirements of the WFM title. She told me that “she was the first WFM in West Africa”. While this is not confirmed it is safe to say that she was the only West African player to get 66% in first nine games (7/11 overall). Asanga was featured in a recent Nigerian Tribune article by Udeme Utip discussing her feat and her journey to the latest accomplishment. She laments regrettably that there has not been the support needed to pursue loftier goals in chess. Of course, with her busy schedule, it would take a gargantuan effort and additional travels. Well, it is by the grace of God and also planning. I have been able to cut out excesses; I don’t have time for anything that is not important. I spend my time on things that are important to me. It is either I am at the hospital, with my children, reading or I am training. I don’t have time for television, sitting down to chat or talk about who is up or down, I focus on things that are rewarding to me. While Nigerian women (and men) earned category prizes in Istanbul, there is very little activity among women players in West Africa outside of Nigeria. In fact, no other West African team was present in Istanbul. Ghana, Sierra Leone, Mauritania and Togo were in Istanbul, all relatively new members of FIDE. However, none of them fielded women’s teams. West Africa’s game still remain draughts, but hopefully there is room for two board sports. 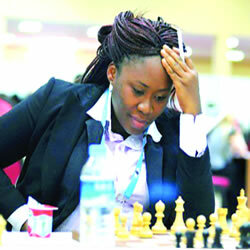 Nsisong describes her future as being “bright” in chess and sees Grandmasters coming to Nigeria. Perhaps Nigeria, a nation of 160 million, can serve as an inspiration for West Africa. A beautiful and busy sister!!! While she has a whole lot going on she appears to enjoy the artistry and simplicity of chess. She is the most energetic and happy player I’ve ever met. When she first met me, she gave me such a warm welcome! I had known her only on Facebook. Lol. Thanks Daaim for all the support. Make That First WFM from An Olympiad ;-). It is truly an honour and somehow it makes the all the hardwork,Faith,Hope & Sacrifice worth it. Draughts isn’t the only board game in Western Africa, there are many others. We just want to see chess grow and glow here. We want to have more oppurtunities and more support from the international community .We pray for better very soon, and we work for it too. Kudos! Yes… there are many games, but in draughts West African players are amongst the best in the world. The Senegalese and the Ivorians are really strong in draughts. I have notice that draughts is popular in Francophone Africa whereas chess in dominant in Anglophone Africa. The late Baba Sy (pronounced “see”) of Senegal was world champion in draughts which proves that Africans can excel in these board sports. I once went on the site for international draughts and got a good reception from players there. There was a thread about Baba Sy and other black players. We need to get West Africans into chess… if there is world champion talent in draughts there is world champion talent in chess! I agree 100% Daaim. A lot of talent waiting to be developed in Africa. Nsisong Bassey and Oluwatobi Olatunji both from Nigeria and west Africa both got their respective WFM titles after the 2012 Olympiads. Nigeria and west Africa has two players with WFM title. Yes… I have checked and Olatunji appears to be credited with the title, but not sure how they calculated. According to the FIDE handbook, WFM requires 66% in the first nine games at the Olympiad. She had 5.5/9 (61.1%) and 5.5/11 overall. Maybe she got her title in combination with other results and they approved it at the Olympiad. Nevertheless, let’s hope these accomplishments are just the beginning. I hope African women shoot for FM, IM and GM titles. I believe the “W” titles may keep women aiming at lower standards. This is cool. Dr. Nsisong had a brilliant performance at the Olympiad.